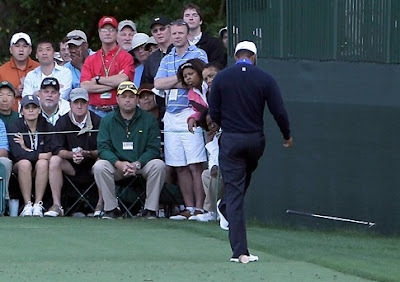 Body Language & Emotional Intelligence: Body Language Analysis # 1502: Tiger Woods' Meltdown at the Masters - "I Want to Wipe it from My Mind!" "I Want to Wipe it from My Mind!" Earlier today, in round three of the 2012 Masters Tournament, Tiger had a major meltdown. His tee shot on 16 went into a bunker and Woods then kicked his golf club. He then gave us a great example of a body language cluster. At the 0:29 mark of the video, he reaches up with his right hand and rubs both eyes. The "Double Eye Rub" is a classic nonverbal wherein the person's psyche is attempting to "wipe from their mind" what they just witnessed. At this point, Woods is primarily trying to erase the memory the loss of his temper rather than the just bad shot. Whenever both eyes are rubbed simultaneously - there is intense emotional processing taking place - the emotional mind is attempting to regroup (please note: "the single eye rub" means something completely different). As the right hand completes the rubbing of his eyes, about a second later, it also rubs his nose heavily on the way down. No doubt Tiger's entire face was "itching". It is an extremely common and even expected for the face to "itch" during such times of stress. In fact, the number one reason people touch their faces' - is anxiety related. Woods' mouth also takes on an expression that most would call a "wince" or "grimace" (0:29 - 0:31, and microexpression recurrence at the 0:32 mark). In this context, his lips-teeth-jaw configuration is one of emotional pain (primarily) coupled with an element of fear (secondarily). Although we cannot see his forehead, we would highly expect its central portion to be contracted (furrowed) with the lateral (outside) portions to be relaxed (smooth). Few of us live under the microscope of media that Tiger Woods does. Like most professionals who are very good at what they do, Woods' emotions are not nearly as well in check as he desires or even believes them to be. One benefit of becoming a student of body language, is becoming much more aware of one emotions, retrospectively, in real-time - and sometimes even as emotions are in crescendo.